We all need a roster of super easy pasta dishes to whip up any night of the week. 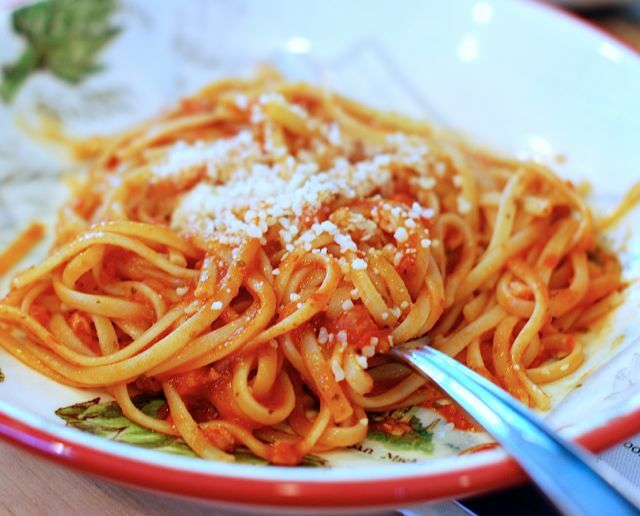 This bucatini all’amatriciana recipe is one of my favorites because it is a welcome departure from spaghetti and meatballs and is a total snap to make. In just three steps you can have the pancetta cooked, a thick sauce made, and a piping hot plate of pasta on the table. For extra heat add some crushed red pepper. Otherwise, omit it and keep it simple. To round out your meal serve up a crispy salad on the side, and dinner is ready in under half an hour! Step 1: Bring a large pot of salted water to a boil and cook pasta according to package directions. Step 2: In a large skillet warm the olive oil over medium heat. Add the pancetta and saute until crispy, about 5 minutes. Remove from the pan with a slotted spoon and place on a plate covered with a paper towel. Step 3: Add the onion and cook until translucent, about 6 minutes. Add the garlic and red pepper and saute for 30 seconds. Step 4: Pour in the tomatoes with their juices and add the salt and pepper. Add the reserved pancetta back to the pan. Simmer over medium-low heat until sauce is thickened slightly, about 10 minutes. Toss with fresh pasta and serve.